We interrupt this program to bring you a special announcement. 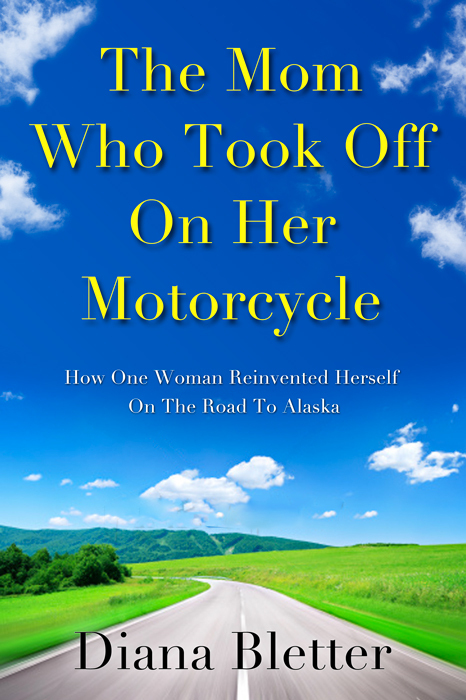 The book cover for The Mom Who Took Off On Her Motorcycle arrived! And in another proof that the universe operates with synchronicity, I am presenting it today, which is the third anniversary of the very day that I took off on my motorcycle for Alaska with my husband, Jonny, on his motorcycle. Summer Solstice, 2009. So this is an anniversary celebration in honor of my best chapter that began the moment I decided to do something extremely different from what I usually do. I wanted to talk a little about my decision to print the book on my own. I had a literary agent at one of the biggest, most successful agencies in New York. She was sure that she’d be able to sell the book for me. (She wouldn’t have invested so much of her time if she didn’t think she could make money.) We worked on it together for a few months and then she sent it out to well-respected editors at a dozen houses. So there I was. I really wanted to publish this book with one of the traditional publishing houses. But part of my whole spiel here on this blog is accepting life on life’s terms. I could have either complained about the publishing industry or change what I could. My choice: get bitter or get better. Back in January, I was going to rush and publish this book for Mother’s Day but my friend Lily (I’ve written about here on my blog) said I should take my time and find out how other people self-print. So I investigated and stumbled upon Catherine Ryan Howard’s blog here. If Diana was Britain’s Princess of Wales, Catherine is Ireland’s Princess of Self-Printing Sales. Her blog is filled with practical suggestions, including go-to names. I found top-notch editor Sarah E. Franklin, (you can twitter her at @SarahEFranklin) who I eventually worked with, and Andrew Brown who designed this winning, wondrous cover for me. Here’s his link. (Go visit there but don’t forget to come back!) He never lost his patience even though I wasn’t sure what I wanted until, like in Malcolm Gladwell’s essay, “Blink,” I knew right away. The cover would make me want to buy this book and I’m my first reader. I will be filling you in on all the upcoming details about The Mom Who Took Off On Her Motorcycle interspersed with our regularly scheduled posts on how you can become the hero of your own life and start your best chapter today. In fact, right now. I’m taking a couple of deep breaths to remind myself that I’m still breathing. Alive. Too often we wait for an outsider, usually a stranger, to give us the validation we think we need. While waiting for an acceptance, what I was really waiting for was the booming voice of the Wizard of Oz to tell me, yes, it is official, you are a writer. But then I realized that the wizard behind the curtain is another bumbling, searching, insecure human like the rest of us. We have to learn to validate ourselves. Self-printing this book, then, is a continuation of what I started to learn on my way to Alaska. This entry was posted in Being a Hero In Your Life, Lily and her stories, self-printing and tagged Alaska, Blink, Book cover, Dorothy Gale, Malcolm Gladwell, motorcycle, New York City, publishing, Wizard of Oz. Bookmark the permalink. Beautiful cover Diana and I’m looking forward to reading your story!. Wishing you great success with your The Mom Who Took Off On Her Motorcycle! That is a glorious cover! Definitely caught my eye and my attention. I can’t wait to read your book. I love this post. I’ve reached the point in my creative ventures where I am understanding that I need to ‘get bigger or get better.’ Right now I am working on the get better part. I’ve surrendered to learning and growing in my work. It’s bringing me peace to subscribe to the track of taking my time to figure out where I need to go instead of putting a timer, a clock on my work (and my expectations of where that work should be). Hi Amy, Thanks so much for you post. Ican relate to what you said about racing against our own time frame and expectations for ourselves. Your artwork and writing are both beautiful. Keep going. I’m cheering you on! Looking good. I like the bold colors, the open road, and the vast sky overhead.